GitHub - teodorpatras/EasyTipView: Fully customisable tooltip view in Swift for iOS. Want to be notified of new releases in teodorpatras/EasyTipView? 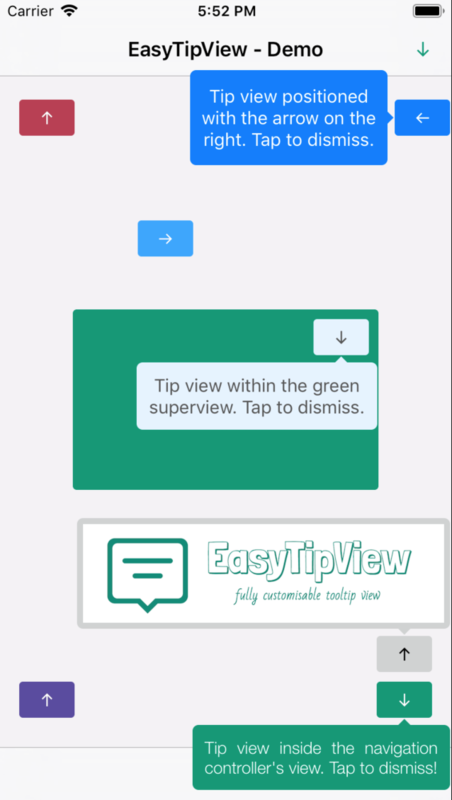 EasyTipView is a fully customizable tooltip view written in Swift that can be used as a call to action or informative tip. Can be shown pointing to any UIBarItem or UIView subclass. Fully customizable appearance (text or custom content view). Fully customizable presentation and dismissal animations. In case Xcode complains ("Cannot load underlying module for EasyTipView") go to Product and choose Clean (or simply press ⇧⌘K). Run carthage update to build the framework and drag the built EasyTipView.framework into your Xcode project. If you prefer not to use either of the aforementioned dependency managers, you can integrate EasyTipView into your project manually. preferences.drawing.font = UIFont(name: "Futura-Medium", size: 13)! Note that if you set the EasyTipView.globalPreferences, you can ommit the preferences parameter in all calls. Additionally, you can also ommit the withinSuperview parameter and the EasyTipView will be shown within the main application window. Drawing - encapsulates customizable properties specifying how EastTipView will be drawn on screen. Positioning - encapsulates customizable properties specifying where EasyTipView will be drawn within its own bounds. Animating - encapsulates customizable properties specifying how EasyTipView will animate on and off screen. cornerRadius The corner radius of the tip view bubble. arrowHeight The height of the arrow positioned at the top or bottom of the bubble. arrowWidth The width of the above mentioned arrow. backgroundColor The background color of the bubble. + .bottom: at the bottom of the bubble. + .any: use this option to let the EasyTipView automatically find the best arrow position. If the passed in arrow cannot be applied due to layout restrictions, a different arrow position will be automatically assigned. textAlignment The alignment of the text. borderWidth Width of the optional border to be applied on the bubble. font Font to be applied on the text. shadowColor The color of the shadow (default UIColor.clearcolor). shadowOpacity The opacity of the shadow (default 0). For the shadow to be drawn, both shadowColor and shadowOpacity must be set to a valid value. shadowRadius The radius of the shadow (default 0). shadowOffset The offset of the shadow. bubbleHInset Horizontal bubble inset within its container. bubbleVInset Vertical bubble inset within its container. contentHInset Content horizontal inset within the bubble. contentVInset Content vertical inset within the bubble. dismissTransform CGAffineTransform specifying how the bubble will be dismissed. showInitialTransform CGAffineTransform specifying the initial transform to be applied on the bubble before it is animated on screen. showFinalTransform CGAffineTransform specifying how the bubble will be animated on screen. showInitialAlpha Initial alpha to be applied on the tip view before it is animated on screen. dismissFinalAlpha The alpha to be applied on the tip view when it is animating off screen. For more animations, checkout the example project. Once you configured the animations, a good idea would be to make these preferences global, for all future instances of EasyTipView by assigning it to EasyTipView.globalPreferences. EasyTipView is developed by Teodor Patraş and is released under the MIT license. See the LICENSE file for details. Logo was created using Bud Icons Launch graphic by Budi Tanrim from FlatIcon which is licensed under Creative Commons BY 3.0. Made with Logo Maker. You can follow or drop me a line on my Twitter account. If you find any issues on the project, you can open a ticket. Pull requests are also welcome.